In today’s technical world, prototypes to production manufacturing requires the right equipment, experience and staff to put it all together. For instance, high tech industries including aerospace, simulation and training, etc. have very specific requirements for precision machining and close tolerances. Additionally, everyday household items are becoming smaller, lighter and cheaper, requiring manufacturers to produce smaller, lighter and cheaper parts. Small part machining in prototypes to production manufacturing has generated and entire industry of innovative problem solvers. The smaller the part, the smaller the tolerances. Close tolerance machining requires the best equipment available and properly maintained by experienced staff to achieve the accuracy necessary for small part machining. Success in small part machining requires matching the correct tool with the precise speed and cooling medium for the material required for the part. Having the right small part machining equipment is just the first step! Small part machining requires the proper inspection equipment. The ability to accurately measure critical close tolerance machining is another key to successful small part machining. Often, this measurement cannot be completed with the naked eye and requires the use of laser measuring technology, 3D microscope and trained staff to ensure small part machining and close tolerance machining project are delivered to specifications. 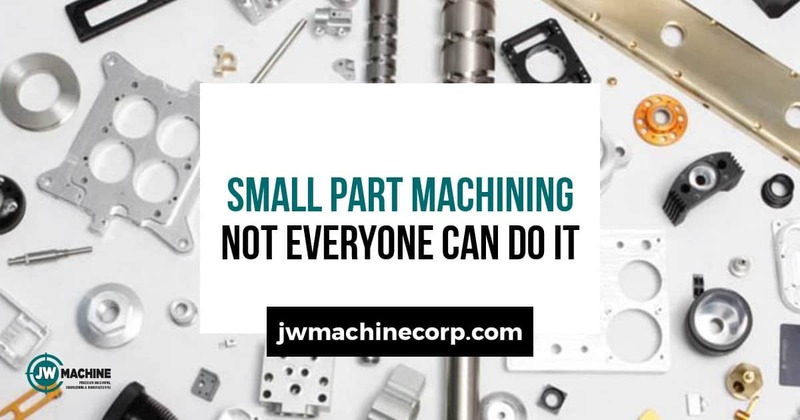 JW Machine has the experience to make your next small part machining or close tolerance machining job a success. Are you seeking a machine shop for your next small part machining project? Or, are you a government or military agency that needs a machine shop that is experienced in your industry and complies with ITAR requirements? If so, JW Machine’s prototypes to production manufacturing experts are just a phone call away!